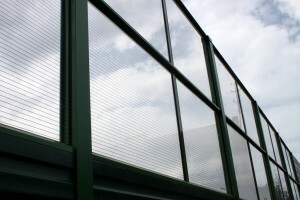 For the purposes of installation of transparent fillings in noise abatement walls, we offer specially designed frames made of aluminum profiles with a double system of seals (internal seal – fixing the filling in the aluminum frame, external seal – sealing the connection of the aluminum frame with the structural pole). The structure of aluminum frames improves the rigidity of transparent fillings, thanks to which it becomes possible to increase the spacing of steel poles, which entails reduced costs of the structure with the foundations. By applying aluminum profiles, the problem of corrosion is reduced. It is also not necessary to drill fixing holes in the steel structure. Assembly of the frames is done by sliding in from above by means of a crane or HDS of ready-made quarters between the shelves of structural poles made of HEA or HEB sections sized from 100 to 220 mm. At the investor’s request, the aluminum frames can be painted any color from the RAL palette, which shall improve the already high aesthetic value and, furthermore, secure the profiles against weather conditions and operational wear.